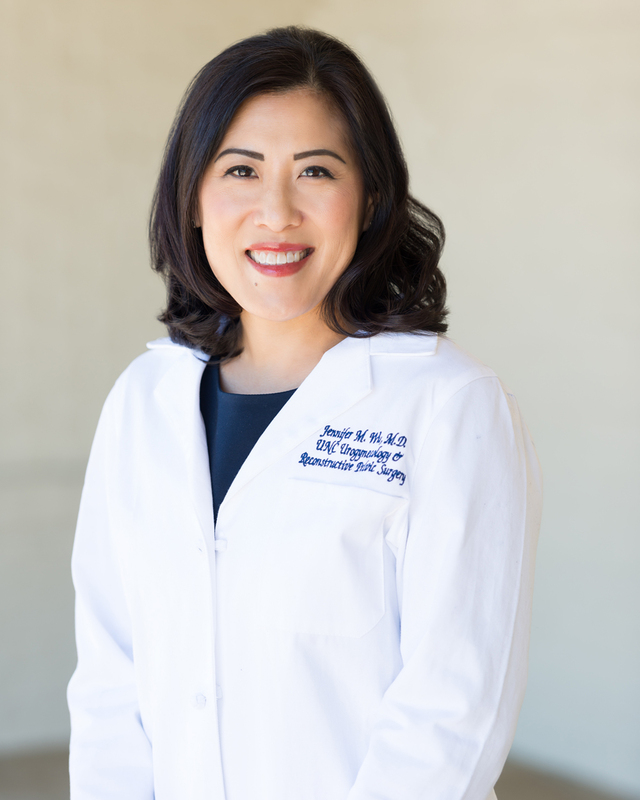 Dr. Jennifer Wu is originally from Frederick, MD. She earned her B.A. in Biology from Harvard University and her M.D. from the University of California at San Francisco. She trained in Obstetrics and Gynecology at Brigham and Women’s Hospital & Massachusetts General Hospital in Boston, MA and then completed a fellowship in Female Pelvic Medicine and Reconstructive Surgery at the University of North Carolina at Chapel Hill. Concurrently, she received her Master in Public Health in Epidemiology at the UNC Gillings School of Global Public Health. From 2007-2012, Dr. Wu served on the faculty at Duke University. In 2013, Dr. Wu re-joined the Division of Urogynecology and Reconstructive Pelvic Surgery at UNC-Chapel Hill to continue her clinical practice in Female Pelvic Medicine and Reconstructive Surgery (FPMRS) and pursue clinical research. She is actively engaged in clinical trials and multidisciplinary research in pelvic floor disorders with collaborators in epidemiology, gastroenterology, geriatrics, nursing, and genetic epidemiology. She currently serves on the Board of the American Urogynecologic Society and is a member of the editorial board for the Female Pelvic Medicine and Reconstructive Surgery journal. She has dedicated her career to studying multiple aspects of pelvic floor disorders and to training future investigators in FPMRS.